I've never taught chemistry. Is Friendly Chemistry difficult to teach? 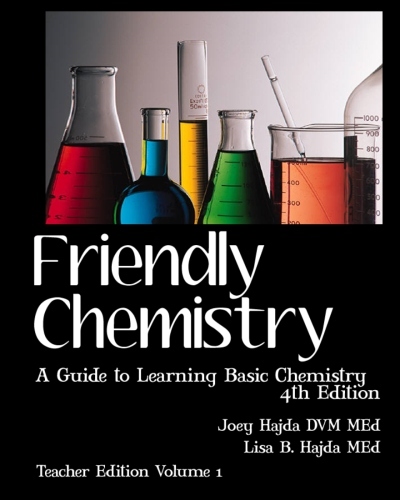 With this fourth edition, teaching Friendly Chemistry has become easier than ever. The course is divided into 32 lessons. In the teacher's edition, each lesson begins with teaching tips which include a lesson plan (we call it the "game plan") and detailed instructions and explanations for each component of the lesson. The teaching tips are followed by the text portion of the lesson and then by opportunities for students to practice the concepts presented (worksheet-type pages). Because we strongly encourage practice in understanding the concepts through a variety of means other than strictly pencil and paper, many card games, board games and active play-type games are included in each lesson. A lesson test concludes each lesson. All worksheets are included in the student editions, eliminating the need for you to make copies. Each practice page and test is accompanied by keys with correct answers. The answer keys are found in Volume 2 of the Teacher's Edition. In addition to the text books, what supplies will I need to find in order to teach Friendly Chemistry? Click here to see the list of supplies necessary to conduct the lab activities and play the games found in Friendly Chemistry. Can my child teach himself or herself using Friendly Chemistry? Yes. Most high school students can use the student edition of Friendly Chemistry to teach themselves chemistry, it's that clearly written. Each lesson builds upon the previous lesson with concepts reinforced again and again. A student working alone, however, will need access to the teacher's edition for solutions to worksheets in the student edition as well as for tests. Using the DVD version along with the text will allow almost any student to complete the course. Do you offer an annotated solutions manual? Yes, we offer an optional annotated solutions manual for users of Friendly Chemistry. This 106-page manual allows users to see exactly how we arrived at all of the answers to all worksheet problems and test questions in the course. Click here for ordering information. The course is divided into 32 lessons which is roughly equivalent to 32 weeks of instruction. Depending upon the age and abilities of your students, you can complete the course in approximately 9 months of instruction. Highly capable or motivated students can obviously finish the course faster. Can Friendly Chemistry be used with co-op groups of learners? Yes! Friendly Chemistry is IDEAL for co-op groups of learners! Many, many games and activities are utilized throughtout Friendly Chemistry to allow your students to practice the concepts presented. Playing games together really makes the learning easy and fun and it has been found that retention of the concepts is much greater when the games are used when learning. Examples of games include: The Stinky-Atom game (players remove shoes and, in relay fashion, build atoms using their teammates' shoes); Atom Smasher (players run from place to place depending upon means of ion formation); the Chemistry Kingdom play; Compound Intensity board game and Compound Football (a rambunctious combination of Rock, Paper, Scissors and football). There will only be one student and myself teaching the course. Is there a version of Friendly Chemistry that would work best for our situation? What is included in the manipulatives set? * Doo-wop Board which is a unique tool to teach electron orbital arrangements and ionization. * Ion Flashcards which are multisized cards which not only teach ion symbol and charge, but also how compounds form. To see more or order the manipulative set, click here. Are there tests and worksheets included in the student edition of Friendly Chemistry? Yes, with each lesson there are 1-3 worksheets which allow students to practice the concepts presented in the lesson. A lesson test for each lesson can be found in the teacher's edition of Friendly Chemistry. Keys with correct answers can be found in volume 2 the teacher's edition. An annotated solutions manual is now available for those desiring a more complete explanation of how each problem is solved. Click here for details regarding this optional manual. What if I already own a student textbook and just want the worksheet and lab pages? Can I get those without purchasing another student textbook? What are the student pre-requisites for using Friendly Chemistry? We generally recommend that a student have or be acquiring basic algebra skills as they take the Friendly Chemistry course. Capable junior high-aged students can do quite well and complete the course with little problem. How much math is there in Friendly Chemistry? In Friendly Chemistry, our focus is on the chemistry concepts. But, as expected, there is math that comes into play in order for the concepts to become useful for us as consumers of goods produced by chemists, whether they be food chemists or shoe chemists or pharmacists, etc. To be successful with Friendly Chemistry, a student needs to have basic arithmetic skills (addition, subtraction, multiplication and division), understand positive and negative numbers, be able to work with percentages and then be able to set up proportions or related fractions and solve for one unknown in these fractions (cross-multiplying and solving for x). Some of the problems in Friendly Chemistry involve several steps to arrive at the solution, but the math never gets more difficult. We work hard to make the math intuitive and not where a child is following some sort of script or recipe while not understanding the reason why the math process they are using makes sense. Does Friendly Chemistry meet my state's standards for a high school chemistry course? Friendly Chemistry meets the standards for a high school chemistry course set by state education entities in most states. We recommend comparing our list of topics covered to the requirements of your state. Contact us directly if you need additional information for your particular state or situation. Can you provide me with a list of lab supplies for the course? Sure, click here to see the list of lab supplies. Orders of 25 or more copies of the student edition are eligible for a discount. Please contact us for details on discounts. How many copies of Friendly Chemistry do I need to order for my family or coop group? Please see our order page for recommended curriculum components for various teaching situations. I have younger members of my family who may accompany our older children as they take Friendly Chemistry. Do you recommend this? Yes! It is amazing how younger children will pick up and retain many of the concepts presented early in the course. As more math concepts are utilized later in the course, they may find it too challenging to continue, but by all means, we suggest younger siblings learn (and play!) along with their older brothers and sisters who are taking Friendly Chemistry. What kind of support can I expect from the authors as I teach Friendly Chemistry? We are available by email to provide with you support as you study or teach Friendly Chemistry. It is our goal to answer all email requests within 24 hours of receipt. We are happy to assist you by telephone between the hours of 8am-1pm Central time, Monday-Saturday. (308)870-4686. Can you ship Friendly Chemistry overseas? Yes! Our order fullfillment center is capable of shipping our curriculum to almost any location around the world. Our products are also available on amazon.com which has worldwide shipping capabilities. Have a question that we didn't address? Please contact us by email or phone or use the handy form below to get your answers to your questions!